Connecticut state officials shared some grim slides with Gov. Dannel Malloy and an invite-only crowd at Rentschler Field three months ago, according to photographs from the closed-door meeting obtained by the Yankee Institute. Photographs taken at the Governor’s 2016 Economic Forum in February highlight a number of troubling statistics. 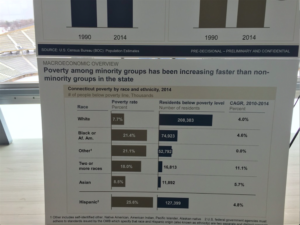 Poverty among minority groups is rising faster than others. 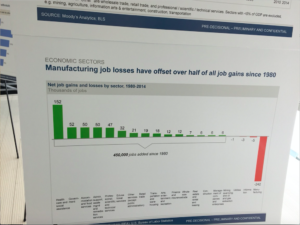 The decline in Connecticut manufacturing jobs has wiped out more than half of all job growth since the 1990s. Middle-skill jobs in the science and technology sector are the hardest to fill. Connecticut has some of the highest long-term unemployment rates in the nation. The photographs show the data points alongside graphs that were featured in the McKinsey report prepared for the Commission on Economic Competitiveness. They are marked “Pre-Decisional,” “Preliminary” and “Confidential.” In the background television screens show the image from the front page of the McKinsey report, also marked preliminary and confidential. The economic forum was an invite-only event held at Rentschler field in February. There was no media present for the day-long meeting, attended by Malloy, and representatives of various government agencies and business associations. The McKinsey report was the latest in a string of bad news for Connecticut. Among the reports findings was deep dissatisfaction with quality of life and job availability among residents in urban areas. The report also showed a steady decline in Connecticut’s manufacturing jobs. 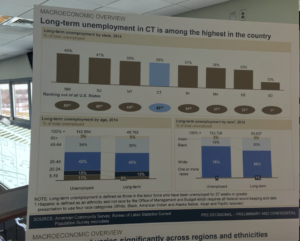 Although the McKinsey report that was released to the public lacked some of the data shown in the slides, the report openly discussed other evidence that Connecticut’s economic climate is in poor shape. The Commission on Economic Competitiveness met in executive session to review the report in March and then released it to the public on April 8. Co-chairman of the committee, Joseph McGee said that there were no differences between the report viewed in executive session and the one released to the public. He said the contents of the slide photographs are “background information” compiled by McKinsey.